This was my Christmas Eve look. I love that this jacket was bought from a fellow blogger's shop my closet section and I think it was the perfect color for a holiday outfit! I kept it simple yet classy in this black wrap dress with black and gold detail accessories. I know it's a bit matchy matchy with the gold and black ring, necklace, earrings, and bag, but it all looked so good together as I set the outfit out on my bed. 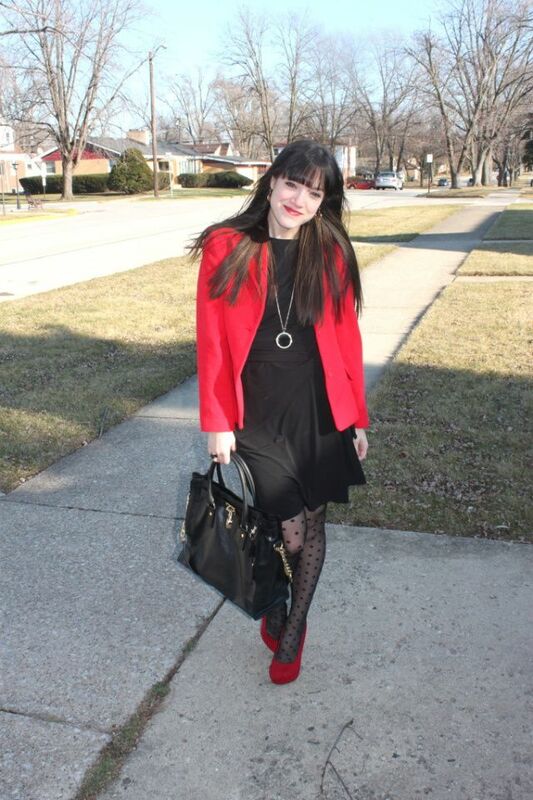 You look great in red and love the polka dot tights! Happy News years dear! Love this look!!! The red is hot!!! And loving the bag!!! I think that you look fantastic! And I love that your new bag is being used so often. It's such a great bag! Happy New Year! hey love your look really nice! !